Kombucha is a drink made from fermented green tea that enjoys a great reputation among many people as a health boosting beverage. Kombucha is said to come from China where it gained the name “drink of immortality” in 215 AD. It then spread to Russia where it was known as “tea kvass” and reached Europe soon after that. Somehow the interest in it got lost during the Second World War. However, after the war a doctor called Rudolph Skelnar revived the interest into Kombucha in Germany by using it to treat cancer patients, people with metabolic disorders, high blood pressure and diabetes. Today, many people who are conscious about their health drink or even have their own Kombucha at home! Kombucha is a ferment that is prepared with green tea and sugar, which will be fermented in the process. For the fermentation process a starting culture is needed, which looks like this (see the picture on the left). 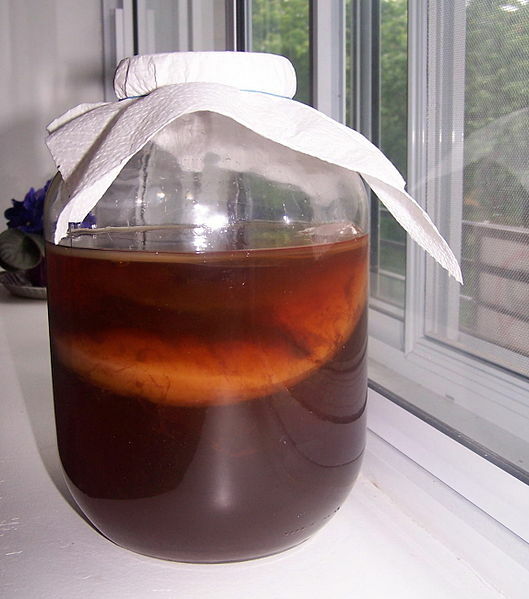 This is called a SCOBY, which stands for symbiotic culture of bacteria and yeast. These bacteria and yeast transform the sugary tea solution into a drink with many vitamins, minerals, enzymes and organic acids that are valuable products for the human body. The final Kombucha will taste a bit sparkly and is comparable to cider or champagne. You might wonder whether the yeast in the SCOBY will actually produce alcohol while fermenting the sugar. The answer is: yes it does, but not much. You can get up to 1 per cent of alcohol in the final Kombucha which I, for my part, don’t consider significant. This fermentation process results in most of the sugar being transformed which means that we are not drinking excessive amounts of sugar when we enjoy Kombucha. Usually less than 0.5g of sugar remain in 100ml of Kombucha. In the fermentation process several organic acids are produced. These include glucoronic acid, gluconic acid, lactic acid, acetic acid and some others which you probably won’t know anyways. Furthermore it produces many B vitamins, vitamin C and several amino acids. Most importantly, and the main reason why I like to drink it, is because of the many probiotic microorganisms that are in Kombucha, which are very beneficial to the health of our guts and intestines. Most of us probably have jeopardized our intestinal health by consuming antibiotics and destroyed the natural flora that we have down there. And since 70 % of our immune system operates in our guts I consider the consumption of probiotics to restore the bacterial flora as quite essential in regaining our health. Not only does Kombucha aid in the elimination of toxins but the probiotic bacteria help us digest other foods as well. Sounds like Kombucha is a perfect way to round up a meal! You can order a SCOBY mother culture over the internet or get it from a friend who brews Kombucha as well. With every batch of kombucha that you make your SCOBY grows and can be divided and shared with friends. Brew some green tea: Boil water, let it cool for 2 minutes, then add the green tea leaves (half a handful) and sugar. I use 100g of sugar for every liter of tea that I make. I myself brew 2 liters every week for my own consumption, feel free to brew as much as you can drink or share! Let the tea cool down, then pour it through a sieve into your glass jar. Before touching the SCOBY make sure to wash your hands with vinegar. Then add the SCOBY to the glass: it will flow on top if it is healthy. Cover the opening with a towel or a piece of tissue so that flies cannot enter and let is ferment for 5-7 days. On the day you want to harvest your Kombucha prepare the new tea mixture 2 hours beforehand to allow it to fully cool down. 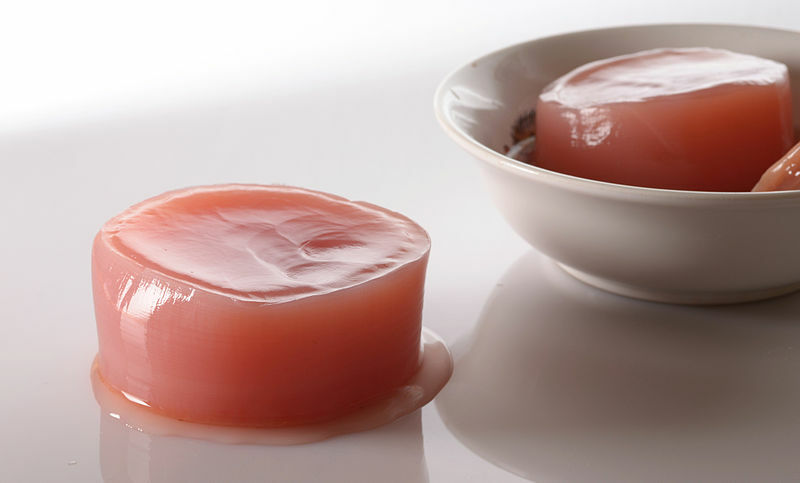 Once again, wash your hands with vinegar and take the SCOBY out of its glass, rinse it with lukewarm water and put it on a clean plate. Now you can fill your Kombucha into bottles using a sieve, then wash the glass jar with hot water and vinegar. Before pouring the fresh tea mixture into your jar add a little bit of your finished Kombucha to help it get started. Then add the tea mixture and the SCOBY, cover it and let it work for a week before you start over again. Keep the Kombucha refrigerated if you can. Rely on your senses for quality check, if it tastes or smells weird, get rid of it. If it tastes lovely, enjoy. Kombucha goes well with mint and honey, stirred into the glass!